The 33rd Biennial CCSEAS conference theme—‘People In and Out of Place’—represents a long standing and yet often forgotten dynamic of a region known as the crossroads of different peoples, histories, cultures and politics. We welcome panels, roundtables and screen works to discuss the meaning of this condition by exploring the conflicting formation and transformation of institutions, knowledges, ideologies, ecologies, identities, places and practices in the rural, urban and peri-urban spaces of the region, and in diasporic Southeast Asian communities. 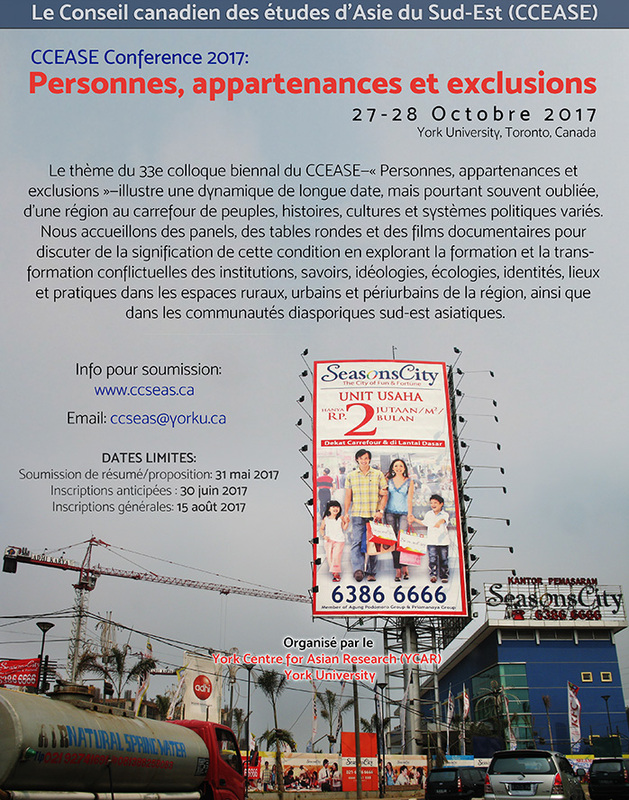 Vist the CCSEAS 2017 web site at http://ccseas.ca or email ccseas@yorku.ca.